I rarely play clubs anymore, but I was asked by four different people to play at the Bowery Poetry Club. On December 3, my trio will accompany poet Ray McNiece, former writer in residence of the Kerouac Writer's Residence in Orlando, which I helped get started. After playing music for Ray with my trio, I will play a set of my own. Ray is an outstanding poet, scholar, teacher and ambassador for Spoken Word at its finest. I was honored to be asked by him to do this, as a way of also honoring my work with Kerouac. There is a whole Kerouac connection to this evening, because Steve Allen, five weeks before he died, in his last public concert, performed with me in Orlando and we raised enough money to make the Kerouac Writers Residence in Orlando a reality. After three years of fundraising, under the guiding hand of Marty Cummins, we put the Residence in the black. Steve Allen and I were the ones who first played for Kerouac's public readings. I started collaborating with Kerouac in 1956 until 1969 when Jack died, and Steve Allen first played with Jack in 1958 at the Village Vanguard. That fall Steve had Jack appear on his national TV show, and also recorded with him. Ray McNiece was chosen as a Kerouac House writer a few months after Steve Allen and I performed our benefit concert for the Kerouac Writers residence in the Fall of 2000. When Ray recently asked me to play for him, as I did with Jack, for a New York/Florida connection, I was happy that I was free to do so. 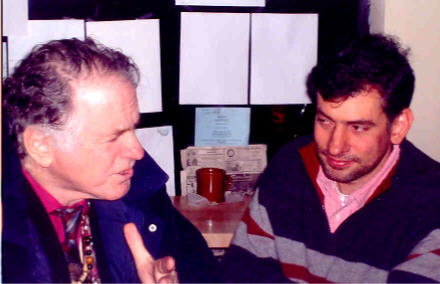 The Bowery Poetry Club is one and a half blocks from the old Five Spot, where I played in 1957 before On the Road was published, and Jack used to come to the Five spot to read with me. (Bob Holman has a poster with a photo of me playing there from Esquire magazine, in his office. He is supposed to have it framed for the club. This photo is in Time Warner History of the 20th Century and the cover of two books. There are black and white copies available, and the proximity of these two places, with the Bowery Poetry Club a few hundred feet from the old Five Spot, where it all started, should be of historic interest). Playing at the Bowery Poetry Club completes a circle, started 45 years ago!!!! On December 11th my trio will be playing with a bunch of musicians from the Vancouver Bongo Beat label, singer/songwriter Lauren Agnelli (she was with the trio "The Washington Squares" and is WONDERFUL) and a group of poets chosen by web author Levi Asher whose site LitKicks was the first one ever to deal with Kerouac, myself and others in an intelligent way. They want me to be the Guest of Honor and also celebrate my 72nd birthday (which is actually November 17) as well as have me play. Like Bob Holman, Levi Asher brings distinction, scholarship and a sense of joy to a fresh way of looking at our era of the 50's. Not Beat but rather beatific... open, inclusive, warm and multifaceted. On January 5th I'll be performing at a reading with poet George Wallace, who has a book and CD (I did all the music for him) published in Italy and coming out soon in the USA. I'll be playing music with George and then doing a set with my trio. This will be from 4-7 p.m. and should be fun. In the past two years, I have helped George Wallace to contact surviving members of our group to participate in two major events which he conceived and administered himself. The first, where the town of Northport celebrated Kerouac's presence there, and the Big Sur four city marathon readings, were both substantial and critically praised events that concentrated on the cultural aspects of our era, rather than a rehash of negative stereotyping. Jack and many of us still surviving were honored as artists who contributed something of lasting value and inspiration to present day artists. George Wallace, in addition to being a prolific and highly gifted poet with a unique style of writing and reading of his work, has a radio show for poets past and present and has created a website, PoetryBay that is a major outlet for many great young poets, as well as established ones. On January 18th I'll be performing with Jason Eisenberg, keeper of the Lord Buckley flame, who is coming from Boston Mass to recite Lord Buckley's incredible raps. Lord Buckley was a major influence for Lenny Bruce, George Carlin and was the first to combine the works Shakespeare, stories from the Old Testament, the Bible, the biographies of Jesus, Mahatma Gandhi and Abraham Lincoln with 1940's hip talk, the poetry of the streets. Buckley died way too young in 1960, I played with him the night before he died, at an event given for him by George Plimpton, to help him gain wider recognition. Jason Eisenberg is phenomenal, the best I ever heard with the exception of Lord Buckley himself. I will be playing a set with Kevin Twigg on drums and John Dewitt at each of these four events. People might be interested to know why, at this stage of my life, I am doing this. I can tell them that, having performed at the beginning of The Five Spot, and with Cecil Taylor, initiating the club as a major jazz center in January of 1957, performing with Kerouac in New York City's FIRST jazz/Poetry readings in Oct of 1957, composing music for FIRST Joseph Papp New York Shakespeare Festivals FIRST summer in 1957, composing music for the Lincoln Center Theater's FIRST production (After the Fall by Arthur Miller) in 1964, being chosen by Leonard Bernstein as the New York Philharmonic's FIRST composer-in residence in 1966, traveling to Cuba with Dizzy Gillespie and Stan Getz, the FIRST musicians to play in Cuba since the Revolution in 1977, and being the FIRST musician to perform at the Bowery Poetry Club in a Gregory Corso Tribute before the Club was even supposed to be open, in the winter of 2002, I know what is of REAL VALUE. The Bowery Poetry Club is one New York City's major cultural innovations of the new Millennium. At a time when Arts organizations are in chaos, it leads the way. Bob Holman is an outstanding poet, a visionary and community minded, just as Joe Papp was. He will set the standard for a whole new way (and a very traditional one) of bringing the performing arts back to where they belong...accessible, for all ages, of many different artists from varied genres rubbing shoulders with one another and having direct contact with their audience, always communicative, reflecting the poly-cultural treasures that make New York City a great place to be. I am grateful to be free to be at these events. I not only see old friends in their 70s and 80s who come. My own children 23, 21 and 18 also love going there and so do their friends. No Responses to "Why I Am Playing The Bowery Poetry Club"